Plastic canvas flowers are made by stitching yarn or fiber onto shaped sections of the segmented embroidery medium. Start with simple petals that are round in shape or elongated blossoms to make 3-dimensional flowers with stems for craft projects. This project is for the needlepoint crafter that has mastered the beginner stitches including the continental, alternating continental or overcast stitch for plastic canvas creations. Attach the plastic canvas flowers to a plastic needlepoint item or arrange them in a floral arrangement. Sketch the shape of the flower onto a piece of graph paper. For instance, look at a photo of a daisy. Draw the elongated petals in the circular shape in a size that will work for the planned project. 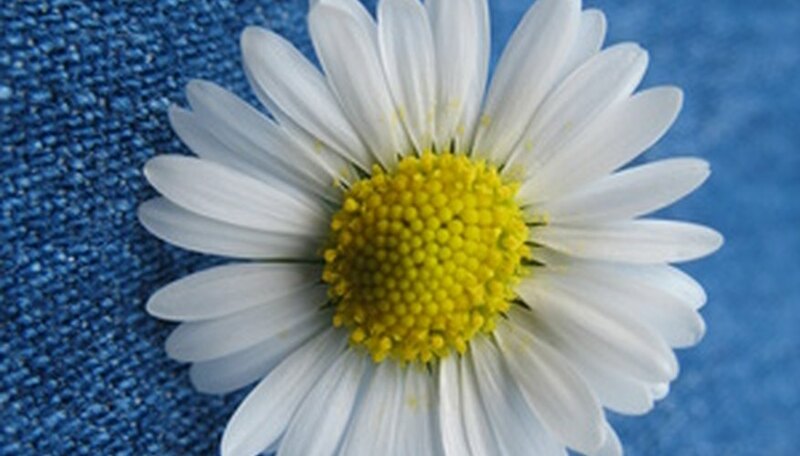 For a multi-petal flower such as a daisy, draw 6 to 8 petals, rather than the natural number. Rounded 6-petal flower patterns can be used for geraniums, forget-me-nots and apple blossoms. Cut out the graph flower pattern from the paper. Remember to trim the partially used squares away as only full squares are used. A pointed petal will have one full square at the end of it. Cutting out the patterns will test the accuracy of the drawing. Transfer the pattern to the plastic canvas by tracing the cut-out graph paper pattern with a pen onto the plastic canvas. Count the squares on the canvas to be sure the patterns match. Cut out the plastic canvas pieces with sharp tipped scissors or a craft knife. When making a daisy, cut out two sections of the six-to-eight petal shapes for a more dimensional flower. Needlepoint the flowers with common plastic canvas stitches such as the alternating continental or continental stitch. Finish the petals with the overcast or whip-stitch to cover the outer edges of the plastic. Fill in the small circle center for a daisy with the alternating continental stitch. Finish the outer edges with the overcast or whip-stitch for a neat finish. Place one set of petals on top of the other for a full flower. Do not line the two sets of petals up. Bend an 18-inch piece floral wire into a U shape. Insert it into the center of the flower petals. Pull both ends of the wire to tighten it against the flower center. Wrap the wire with floral tape on an angle. The tape is non-adhesive. Pull the tape tightly against itself to cause it to fuse it together. Glue the pom pom to the center of the blossom with fabric glue or stitch it together with yarn. Cut leaf shapes from plastic canvas. Stitch the leaves with green yarn or fiber. Wire the ends of the leaves and secure them to the main flower wire with floral tape. Experiment with shaped petals and more advanced stitches after you have made several of the simpler flowers.